The McKay touring car represents the first attempt to have automobile manufacturing in Nova Scotia. It was built in 1912 by the Nova Scotia Carriage and Car Company of Kentville. Daniel and John McKay took over the Nova Scotia Carriage Company in 1908 and began producing cars in 1910. They built the bodies mostly of wood and installed Buda engines imported from the United States. The McKays were producing a luxury vehicle, comparable in quality and price to the Packard. They were asking $1450 to $2300 for their cars which was high next to the increasingly popular Fords that sold for about $1000 in Nova Scotia by 1912. At the time car financing did not exist so customers had to pay cash for the vehicles. In 1912 the McKays were invited to move their business to Amherst, a thriving railway town with several other large businesses. The town offered irresistible incentives like tax breaks and cheap land and the McKays were settled in their new home by 1913. The building, on the edge of the Tantramar Marsh, was very expensive to build and soon the company found itself in serious financial trouble when there was an economic downturn in 1913. The last car was made in 1914. 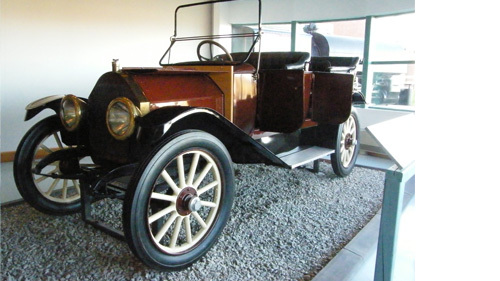 The McKay car on display at the Museum of Industry is a 7-passenger model with a 4-cylinder, 40 horse power engine. A small plate identifies it as number 170. It was discovered in pieces in a barn in the Gaspareau Valley of Nova Scotia in the early 1970s. It was re-assembled and restored for the Museum by the Pictou County Antique Auto Club.